This article is 1040 days old. 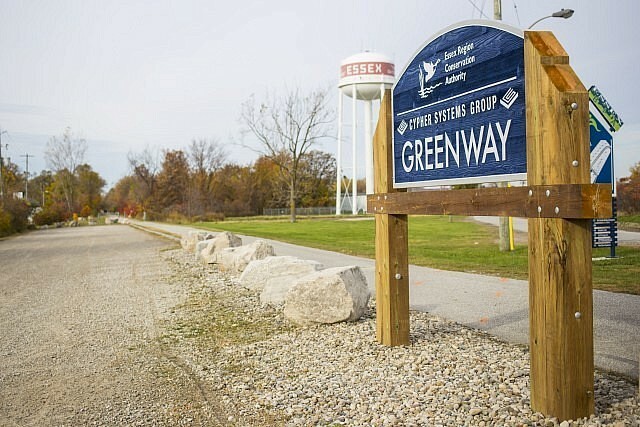 Construction of the Cypher Systems Group Greenway will get underway later this summer. Nearly 20 kilometres of multi-use trail will be constructed, stretching from Amherstburg to the urban centre of Essex, and intersecting with the existing Chrysler Canada Greenway. As part of this process, ERCA is reminding neighbouring landowners to remove any personal items, fencing or structures from this corridor which is owned by ERCA. “ERCA has owned and paid taxes on this property since 2004,” adds Kevin Money, ERCA’s Director of Conservation Services. “As we move forward with the construction of this long awaited and much anticipated community amenity, ERCA will be reminding neighbours of property boundaries to ensure that any encroaching structures are removed prior to the commencement of construction.” ERCA will also be planting native trees and shrubs within two feet of the property line in some areas to improve aesthetics, biodiversity, water quality and connect core habitats. “This is consistent with process undertaken to develop the Chrysler Canada Greenway in the late 90s, which has proved to be a remarkable success,” Money goes on to say. ERCA will also identify and confirm farm crossings, where property is owned on both sides of the Greenway, and ensure appropriate easements are in place for these crossings to continue. “We are very excited to break ground on this project in the coming months, and look forward to working with our neighbours to ensure that construction can begin in a timely manner,” Wyma concludes. Work on the trail is expected to begin in August and will last for several months.